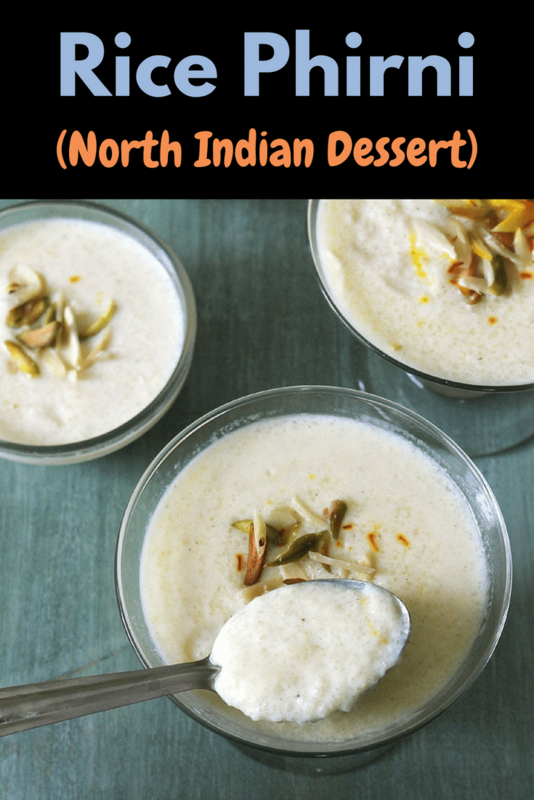 This super delicious, sweet rice phirni is North Indian dessert. It is made during festivals like Diwali, Raksha Bandhan, Karwa Chauth or made on special occasions or pooja. Phirni is nothing but the ground rice pudding. Phirni is made from coarsely ground rice, milk and sugar. It is cooked on slow flame which results in creamy, rich and thick texture. It is flavored with cardamom powder and saffron. Though there are many different flavor varieties are made e.g. mango phirni, rose phirni, apple phirni. Once ready, it is poured into individual small shallow earthen bowls. Garnished with sliced nuts (almonds, pistachios) and saffron. Sometimes it is garnished with rose petals to. Or sometimes it is garnished with silver leaf (vark). 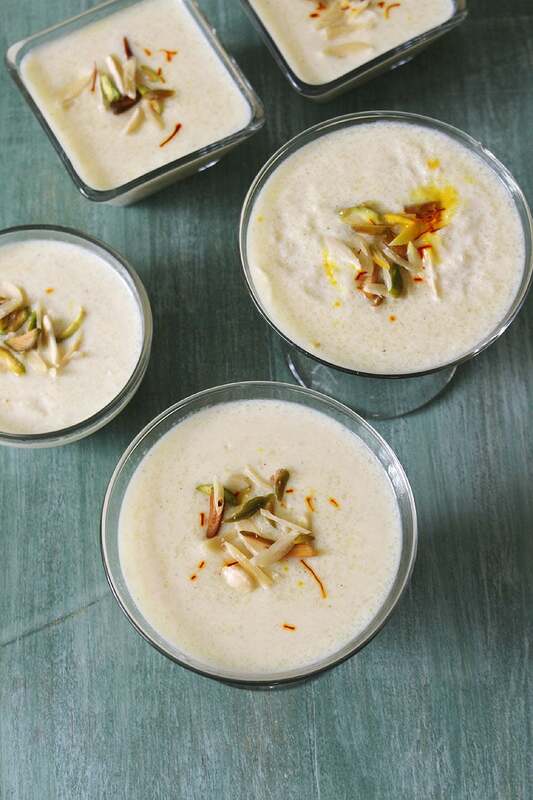 This rice phirni is always served chilled. Yes, it tastes BEST when served chilled. 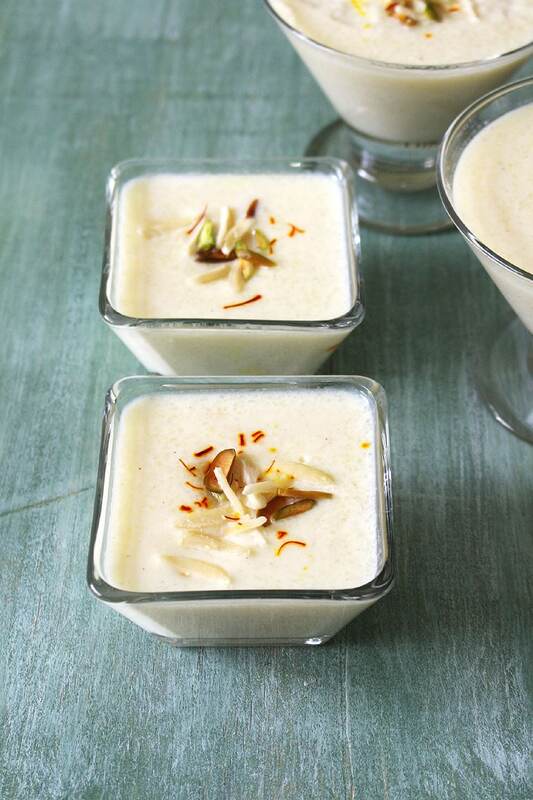 What is the difference between phirni and kheer? The taste and ingredients used for making phirni and kheer are almost same. But the difference is in texture, cooking method and serving method. Phirni is made from soaked, coarsely ground rice paste while kheer is made from whole basmati rice. Sometimes kheer is made using cooked rice. Phirni has more thicker and creamier texture because of ground rice vs kheer which has soft, succulent rice grains. 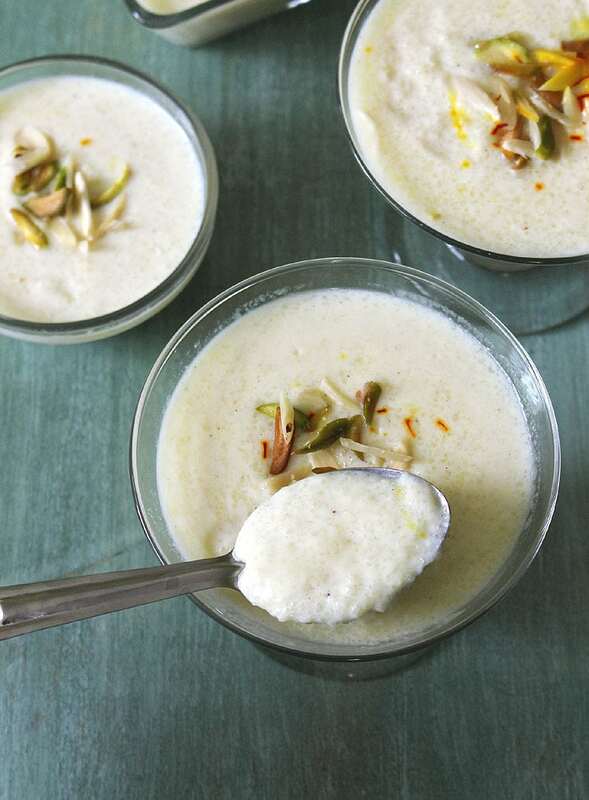 Phirni always served chilled while kheer can be served warm or chilled as per your preference and liking. 1) To blanch almonds and pistachios, soak them in boiling hot water for 20-30 minutes. 2) After that peel the skin and slice them using knife. 3) Wash the rice under running cold water or rinse then 2-3 times till water is clear and no more cloudy. Soak in enough water for 15-20 minutes. 4) After that discard the soaking water, take rice into the grinder jar. Add fresh ¼ cup of water and grind into coarse paste. Make sure not to make fine paste. 5) Heat the milk on medium heat in heavy bottom pan. And let it come to a boil. 6) Once it starts boiling, add prepared ground rice paste. 7) Mix and continue cooking. Do stir in between and also scrap the sides and bottom of pan to make sure that milk is not sticking to the pan. 8) Cook till ground rice grains are soft and also the milk has thickened. It will take around 15-18 minutes on medium-low heat. 9) Now add sugar, stir well. 10) Also cardamom powder and saffron, mix. 11) Continue cooking for 5 minutes with stirring occasionally. 12) Now add rose water, mix and turn off the stove. 13) Transfer it to individual serving bowls. 14) Garnish with sliced almonds and pistachios. Crush the few strands of saffron between your finger and thumb, then sprinkle over the phirni. Cover it with plastic wrap or small plate/lid. Chill in the fridge for few hours. Serve chilled. Serving suggestion: Enjoy this as a dessert (after meal) during festival season or special occasions. This rice phirni is the traditional Indian dessert and made during festivals like Diwali, Raksha bandhan, karwa chauth. This is nothing but ground rice sweet pudding garnished with almonds, pistachios and saffron. Blanch the almonds and pistachios by soaking in boiling hot water for 20-30 minutes. After that peel the skin and slice them. Also wash the rice and soak for 20 minutes. After that discard the soaking water and grind into coarse paste using fresh ¼ cup of water. Take milk into heavy bottom pan and bring it to a boil on medium heat. Once starts boiling add coarsely ground rice and cook for 15-28 minutes or till the rice is cooked and milk is thickened. Do stir in between and scrap the pan, so milk does not stick and burn. Then add sugar, cardamom powder and saffron. Mix well and cook for 5 minutes. Now add rose water and turn off the stove. Pour into individual serving bowls, garnish with sliced almonds, pistachios and crushed saffron strands. Cover it and chill in refrigerator for few hours and then serve.